Why Should Colleges & Universities Choose Managed Print Services? College and university campuses are often large, with several different buildings, departments, and faculties all working under the larger umbrella of the institution. With the many activities that occur on a campus throughout a day, week, or school year, there is a lot of printing that needs to be done. However, a printer needs to be more than a printer these days. In addition to paper documents, staff and faculty must manage digital documents, workflows, and more. All of this can become very time-consuming and, as these tasks add up, it means less time for other activities and reduced productivity. 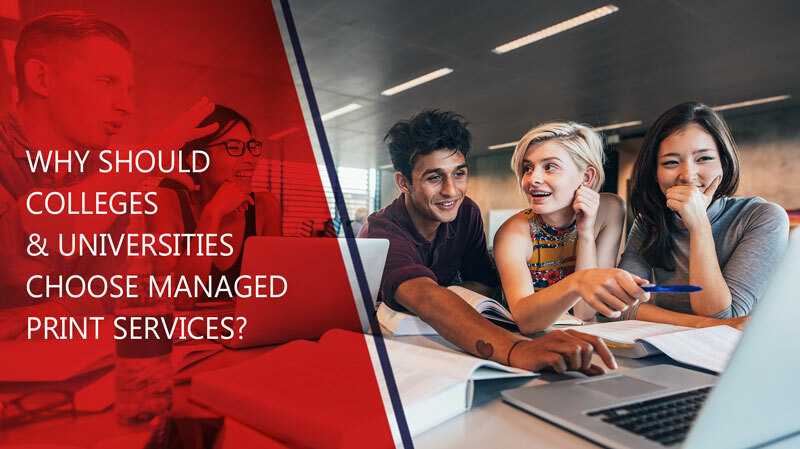 Managed print services for colleges and universities are designed to ensure departments have the right devices to deliver better service more efficiently. Xerox Workgroup Printers can be a key part of an effective managed print solution for higher education. The work environment of today is not like the work environment of even just 5 or 10 years ago. New technologies have changed the way we work. In fact, 60% of employees use mobile devices to complete their work. If productivity is going to be improved, then managed print services for colleges and universities must accommodate the devices we use to get our work done. Xerox Workgroup Printers don’t just allow for basic printing or copying but they bring modern connectivity to any workplace. Best of all, the interface supports the services your college or university already uses. Easily integrate your favorite cloud service for seamless document sharing, printing, and scanning from any device. With managed print services, the right devices are deployed to ensure that everyone can do their work on the devices they count on most. This helps increase productivity, improve collaboration, and simplify sharing. In today’s office environment, flexibility is important. Being able to adapt to changing trends and needs is essential to ensure that staff can do their work to the best of their abilities. Xerox provides this ability with their managed print services tools. Xerox ConnectKey-enabled devices can be monitored remotely for up-to-date statistics. Print usage can be tracked, audited, and changes can be made to ensure that devices and users are able to operate as efficiently as possible. Not only is this important to help people get their work done more effectively, but it can help reduce paper waste within an institution. In fact, half of all waste in offices is due to paper. Reducing waste with managed print services and device monitoring is a fantastic green initiative that can also save a lot of money. With this detailed monitoring, heavy device users can be identified and solutions can be quickly developed to improve device selection, device placement, or even workflows. Xerox Workgroup Printers have the capability for this deep monitoring baked right into their software so the monitoring is simple, efficient, and effective. One common issue that is identified when implementing managed print services is that the wrong devices have been deployed for the needs of the users. A typical example of this could be personal printers in each office or cubicle for a small team. The capability of these printers is far less than a Xerox Workgroup Multifunction Printer and, due to the number of devices, management, maintenance, and supplies can actually end up costing more money. Worst of all, when users need to complete a task like copying, scanning, or sharing to a cloud drive for collaboration, the individual devices at their workstation cannot meet their needs. As a result, users have to walk to a different device and potentially use several different functions to accomplish their end goal. This means there are multiple devices, all accomplishing different goals, when one unified solution like a Xerox Workgroup Printer would work more effectively. Managed print for higher education leads to simplified device management, better productivity, improved performance, and reduced costs. Every level of the organization should be able to clearly see the benefits of managed print services. Managed print services for colleges and universities can make a huge difference in the efficiency and productivity of a number of departments. Xerox Workgroup Printers are designed with managed print services in mind. Ready to take full control over your print, copy, and document sharing infrastructure? Contact us at Zeno Office Solutions for more information about managed print services and the incredible benefits.